National Hockey League player Shane Doan triumphed May 4 by scoring a hat trick in a game against Belarus. As captain of Team Canada, his three goals helped ensure that Canada will make it to the quarter-finals of the World Hockey Championship. NHL star player Shane Doan. 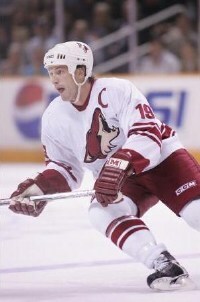 Doan also recently made headlines over allegations that he had made a derogatory comment to a French-Canadian referee. According to the Toronto Star, NHL officials came to Doan’s defense, saying he had been cleared of any wrongdoing well over a year ago. One positive thing that was stressed in some of the media coverage was that fact that Doan is a committed Christian. In a recent issue of Faith & Friends, before the controversy erupted, Jayne Thurber-Smith profiled Doan. Shane Doan is stickhandling his way through the National Hockey League (NHL) with grace, faith and a firm belief in family. In the celebrity world of the NHL, players can easily get caught up in any number of off-ice vices and temptations. But Doan, the 30-year-old captain of the Phoenix Coyotes, decided early on that he would do things God’s way and not chase after the “fleeting pleasures of sin” (Hebrews 11:25). Shane grew up in an environment of wholesome and healthy activity. His parents own and operate Circle Square Ranch, a Christian camp for kids of all ages, in Halkirk, Alta. The camp offers horseback riding, swimming and archery. Shane’s dad willingly shares his parenting secret, which is really no secret: It’s the Bible. “My wife, Bernice, and I had a book of special Bible verses, which we encouraged our kids to memorize,” he says. “We would go over them together at suppertime. One verse in particular that we constantly brought to Shane’s attention was: “Whatever you do, work at it with all your heart, as working for the Lord, not for human masters” (Colossians 3:23). Another opportunity for sharing came the year Shane was 15 and playing AA hockey with 16- to 18-year-olds. The arena for that level of play was an hour’s drive from Halkirk. Having to travel so far for every practice and every game resulted in plenty of father-and-son time. These verses stuck with Shane and he was able to stand strong in his faith while in Kamloops. He refused to yield to the temptations available to a teenager on his own. His efforts were blessed and in 1995 he was signed by the Winnipeg Jets, where he was chosen Rookie of the Year. That verse has helped Shane ride out the ups and downs of a professional hockey career. After only one year in Winnipeg, the Winnipeg Jets moved to Phoenix and became the Coyotes. “As long as I was with the NHL, I was fine with that,” says Shane. In an age where players sell out to the highest bidder, Shane has remained faithful to the Coyotes, spending his 11 professional years with the same franchise. He even says that the hockey strike of 2004-2005 was a blessing in disguise because his wife, Andrea, had just had a baby and he was able to share in his new daughter Karys’ first year. He also enjoyed spending extra time with his daughter Gracie (now eight) and son Josh (now four). Although Shane missed a few weeks of play this past November as the result of a back injury, he continued to trust God. “I was back to being able to play again after a short break, which is good because I don’t like just watching!” he says. “When things like that happen, you realize how little control you really have. The more you fight for control, the more frustrated you get. You need to accept what God is doing in your life. You may have questions but you don’t let them consume your thoughts. You have to enjoy the blessings of every day. Shane scored the tie-breaking and game-winning goal for Team Canada in the finals at the World Cup of Hockey in 2004. He was also selected to play for Team Canada in the 2006 Olympics, but the highlight of 2006 for Shane was not hockey-related but family-related. Along with all those Bible verses, Bernie has passed on to his son the love of family. Shane’s son, Carson, was born in September. Even though his family is his priority and his own children keep him busy, Shane found time in December to deliver Christmas presents along with other Coyotes teammates to the sick kids at Phoenix Children’s Hospital. He also supports the Thomas J. Pappas School for homeless children in Phoenix. Shane says that he’s now reading The Cure for the Common Life by Christian author Max Lucado, although one might argue Shane’s life is anything but common. He’s busy donning his father’s mantle of being a godly family man, raising godly kids- maybe even a future hockey star.